Translating discoveries from the lab to actual treatments and cures is a glacial process. Houston Methodist does it differently: our research strategies and innovations can reduce decades to years. Ways you can support research include funding for transformational research, laboratories, funds and clinician scientists. TRI is a unique philanthropic program with an entrepreneurial slant. A gift to the TRI funds innovative research focused on bold ideas ready to move from the lab to the clinic. With TRI1 complete, we have launched TRI2 through the generosity of the Jerold B. Katz Foundation. Our goal is to raise a total of $10 million to launch a new series of investigations with the potential to change the lives of patients quickly. A gift to TRI leverages philanthropic dollars for sustainability and greater impact—multiplying the impact of each contribution. Once complete, a generous commitment from Paula & Rusty Walter will launch TRI3. An endowment to support a research laboratory propels a priority program forward by providing a base of funding that can be drawn from in perpetuity. Such funds can recruit and support leading scientists and purchase advanced equipment and materials. The designated research fund provides resources for physicians and scientists to explore novel but promising areas of research. This stability provides the platform for innovation and medical discovery, often resulting in data that leads to federal grants to advance a field. Clinician scientist positions serve to recruit, retain and develop specialists who possess a blend of talent and devotion to bridge research and clinical practice. These positions are awarded to early-stage clinical investigators to develop an independent research program while maintaining clinical activities. Read more about or friends and benefactors whose leadership and generosity have helped to build our legacy and take this next step forward. As Dr. Dale Hamilton leads Elaine and Marvy Finger on a tour of his new laboratory on the 11th floor of the Houston Methodist Research Institute, they marvel at its progress. Not too long ago, the lab had five employees and a much smaller space on Fondren 8. Today, a team of 24 scientists and lab technicians work diligently to unravel the mysteries of bioenergetics and the role energy transfer plays in everything from aging and heart failure to neuro-degenerative diseases and cancer. Their laboratory space includes room for additional growth. The Fingers recently made a generous gift to elevate Dr. Hamilton's endowed chair to the Elaine and Marvy A. Finger Distinguished Chair for Translational Research in Metabolic Disorders. The resources provide a pathway for Dr. Hamilton's team to rethink the way we look at diseases and the common ground they might share, as well as to enjoy a culture with the scientific freedom to explore big, new ideas. "He was my physician; he became my friend,” says Marvy, head of The Finger Companies, one of the nation's leading independent developers of luxury multifamily properties. "It was just natural we would want to support his endeavors. Along with Dr. Hamilton's intellectual ability, his enthusiasm and dedication are overwhelming. It's very exciting." The couple are longtime Houston Methodist supporters. Marvy has been a member of the Houston Methodist Hospital Foundation board for more than six years, and also leads his own Marvy Finger Family Foundation. Elaine has served on the Houston Methodist Women's Health Committee. Dr. Hamilton says filling an endowed chair bearing their names "is a tremendous honor." His team has several projects underway, including studying estrogen's relationship to heart health, diabetes and metabolic disorders; mitochondrial changes in the disease process, including in heart failure and neuroendocrine tumors; and the potential to transplant healthy mitochondria into cells with dysfunctional mitochondria, which are the tiny engines responsible for energy transfer in our bodies. "Elaine and Marvy have supported our work for many years and really made this transformational growth possible:' Dr. Hamilton says. "We design our own experiments, our science is pure and we have a culture in our lab where people at all stages of their careers can develop and flourish." "My father is a force of nature,” says his son, Evan H. Katz. “He is passionate and driven. He is like the sun behind a magnifying glass. His creativity leads and inspires us with the belief that we can do seemingly unimaginable things. 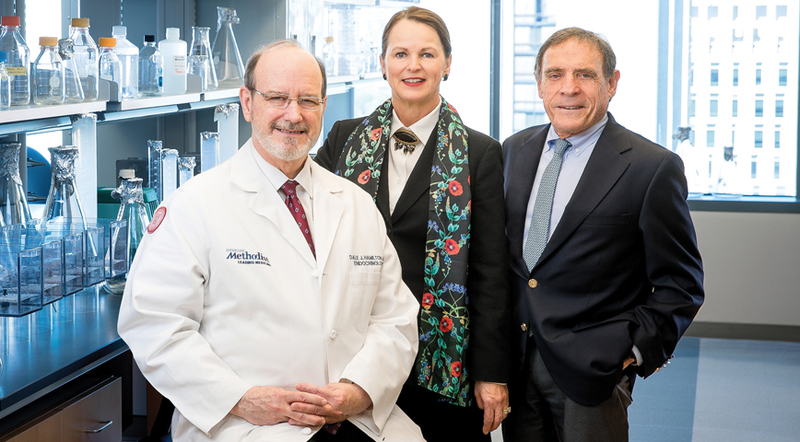 It is this overwhelming belief that produces miracles.” This inspiration led Mr. Katz and his family to make their most recent gift to Houston Methodist - a gift primed to advance the pursuit of life-changing discoveries in the laboratory that will lead to innovative treatments for some of our most critical health issues. The Jerold B. Katz family's $21 million commitment to Houston Methodist is the largest non-estate gift awarded in the institution's nearly 100-year history. It will provide the sustained resources needed to accelerate effective medical discoveries from the laboratory to the patients who need them. Jerold B. Katz had humble beginnings, growing up in the America of the 1930s and 1940s. Born and raised in St. Louis, Missouri, he was a child of the Great Depression and his family struggled to make ends meet. Mr. Katz's youth was one of hardship and toil. He took on multiple jobs, first as a youth and into his early adulthood, to scrape together funds for his family. "I sold newspapers when I was 10 years old,” says Mr. Katz, now 85. "I was so cold and so hungry. That feeling, that hunger, never left me. It drives me to this day." He saved enough to put himself through college and law school at Washington University in St. Louis. In his early 20s, he moved to Houston, arriving in the mid-1950s. He discovered a city with unlimited possibilities. "Houston was a turning point for me,” Mr. Katz says. "It was and still is a city of opportunity.” In 1957, Mr. Katz founded Gulf Coast Collection Services in a one-room office on Fannin Street. He began modestly and started to collect debts for local law firms and other Bayou City businesses. This was long before consumer debt existed as it does today, but in 1958 when American Express created its ubiquitous "green card,” it had the potential to change the way Americans managed personal finances. Mr. Katz could see the change the card might potentially bring to the nation. He knew he had to do something bold to elevate his fledgling business. His son, Evan, tells the story of how his father was 26 years old when he flew from Houston to New York City to propose a collection idea. The entrepreneur walked confidently into company headquarters and asked for "all of their business.” For one week, he was rejected every day by the company's collection officers, but he kept returning until they relented. He promised to save the company millions by collecting the tens of thousands of unpaid debts of less than $25. He was awarded that part of the massive account, and with that, American Express started sending boxes of unpaid bills to Mr. Katz's tiny Houston office. The card's popularity soon soared - and his firm was among the early providers of collection services to the monolithic financial services company. As he prospered, the major oil companies began issuing gasoline credit cards in the 1960s. Mr. Katz won that business, too, followed by collection work from big banks and large commercial issuers of debt, and then later government collections of student loans and unpaid taxes. His business acumen turned the one-man collection agency into one of the nation's largest business process outsourcing providers, with billions of dollars in collections and more than 10,000 employees in 30 call center sites all over North America and the Caribbean. The company, now known as GC Services, thrives today after six decades of continuous operation. American Express remains one of its clients. As his business grew, Mr. Katz married and he and his wife Judith began their family, settling into life in Houston. The family's hospital of choice was Houston Methodist. The family's lives changed tragically in July 1988. Their son, Lenny, a newly minted Tulane University graduate, was injured in a single-car accident that left him in a minimally conscious state. Lenny has remained in that condition for nearly 30 years. With the same fervor and passion that he used to start his company, Mr. Katz and Judith dedicated themselves to finding answers for patients with traumatic brain injury. The Katz family's generosity has provided millions in funding for research into brain injury, metabolic disorders, health care quality and outcomes, and other initiatives at Houston Methodist, Weill Cornell Medical College and other medical institutions throughout the city, state and nation. And this most recent contribution marks the pinnacle of the family's giving, providing a lasting resource to find better treatments, improved quality of life and, ultimately, hope for patients who previously had none. The extraordinary commitment by the Katz family will focus on advancing promising translational research projects and new technologies that have commercial potential. The gift will help bridge the funding gap known as the "valley of death.” This is where innovative research gets halted in the laboratory, awaiting additional testing due to lack of funds. These critical dollars will allow researchers the time to establish proof-of­ concept, which is critical to attract investment and development partners. "Our gift was conceived to help speed cures and treatments to people in need. We want to continuously seed future rounds of discoveries that will help advance health care for decades to come” says Evan. The Katz gift funds three new separate but collaborative areas of research, building upon the Houston Methodist Research Institute’s history of discovery and investment in research and facilities. The areas are the Jerold B. Katz Academy of Translational Research, featuring the Jerold B. Katz Investigators; a Translational Research Initiative fund; and the creation of the Jerold B. Katz Translational Research Infrastructure Fund to build out labs and purchase specialty equipment. The centerpiece of the gift is the establishment of the Jerold B. Katz Academy of Translational Research, which initially funds eight physician-scientists who will hold a $1 million endowment, as well as the necessary annual operating expenses related to their research. Each investigator will hold his or her position for five years, but retain their title for life, even as they rotate out of the program. Recipients of the Katz Investigator awards are researchers working on early-stage projects and will be selected through a proposal process by an advisory committee composed of scientific leaders from Houston Methodist and leadership from the Katz Foundation. The advisory committee also will help to oversee and assess progress of the funded projects through a process designed to reach specified milestones according to investment-grade criteria. The second part of the Katz family's gift dedicates $5 million to the Translational Research Initiative 2 (TRI2). The Katz Foundation chose to fund a second TRI to continue the model of the highly successful TRI1, a $10 million philanthropic investment pool that supports several promising medical discoveries. TRI2 is designed to build added value around early-stage research projects with commercial potential and generate more investment-grade, partnership-ready opportunities. Because TRI2 is a matching challenge, it boosts the Katz gift's impact to $26 million. Mr. Ernest H. Cockrell, longtime Methodist supporter and a life member of the hospital’s board of directors, was instrumental in bringing the Research Institute to life. The Cockrell family, through the Cockrell Foundation, created the distinguished endowed chair for the president and CEO, first held by Dr. Michael Lieberman and now by Ferrari, and was a key player in the Research Institute’s inception. When asked about its miraculous development over the past eight years, Cockrell shares that he is not at all surprised that a world-class academic research institute was conceived at Houston Methodist. ADVANCING PATIENT CARE The Research Institute was founded in 2004 for the sole purpose of supporting, managing and conducting clinical and translational research for the advancement of patient care. As such, it is carrying on the tremendous legacy of Dr. Michael DeBakey, the world-renowned cardiovascular surgeon and medical educator who, during his long tenure at Methodist, developed a great many innovations that are still regarded as the gold standard in heart and vascular medicine. In 2010, the Research Institute opened the newly constructed, state-of-the-art, 440,000 square foot building adjacent to Houston Methodist Hospital. This expanded the dedicated research space at Methodist to 560,000 square feet for the 1,500 researchers working on translational platform technologies, including nanomedicine, systems medicine, bioengineering and imaging with applications in cancer, neurosciences, cardiovascular disease, metabolic disease and infectious diseases, among others. The Cockrell Center for Advanced Therapeutics, which was recently launched to oversee clinical research trials, is located in the heart of the main campus, bridging the Research Institute building to the main hospital. LEADING THE CHARGE Ferrari, who joined the Research Institute in 2010 following the retirement of founding CEO Lieberman, is a living illustration of this philosophy. Trained in mathematics and engineering, he was working as a tenured professor at Ohio State University before enrolling in medical school at age 43. “Here, I can collaborate with the best clinicians and biologists there are in cancer, certainly, but also in all the major fields – neurology, heart, transplant and immunobiology, orthopedics and diabetes and other metabolic disorders,” he says. “That’s how ideas arise – by bringing people of different skill sets together.” Cockrell agrees and adds that the Research Institute has developed as he and others envisioned but much more rapidly than expected. He encourages potential contributors to consider Methodist a wise investment of their philanthropic dollars.